A question I get quite a bit from clients as well as friends and family is this: "What do I eat if I am on the run and don't have healthy food with me?" Over the years I have done a lot of research and taste testing to be able to answer this question as well as I possibly can. Obviously, I believe that preparation is of utmost importance when it comes to keeping a healthy diet. Grocery shopping with a list, having your meals planned for the week and bringing along enough clean meals and snacks to last you throughout your day are key. But I also understand that things happen and it's hard to always be 100% prepared. In situations such as this, it is important to have a back up plan. Notice I say back up plan and not a go-to when you are feeling lazy or too tired to pack your lunch! 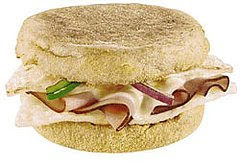 Subway's new breakfast sandwiches, which I just tried for the first time last week. It was suprisingly tasty and resembled what I might make at home on a Saturday morning. I tried the Western ham and cheese which consists of a wheat english muffin, egg or egg white (I chose the egg white), black forest ham, bell peppers and onion and a touch of cheddar cheese, toasted to melty goodness. At only 180 calories, you would want to pair it with some fresh fruit and a bit of non-fat yogurt to fuel you throughout the morning, but in my opinion, a no-brainer alternative to Dunkin Doughnuts or McD's for an on-the-run option. 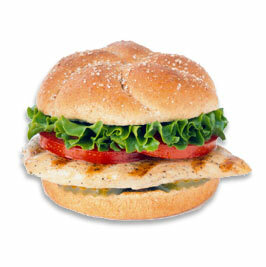 Chik-fil-a's Grilled Chicken Sandwich, which also conveniently comes on a whole grain bun! And unlike other places with a "healthy" chicken sandwich, Chick-fil-a serves their sandwiches with suprisingly plump tomato slices and a few crisp pieces of romaine. The first time I tasted this chicken sandwich I was impressed! It contains 300 calories, but resist the urge to splurge on their waffle fries and avoid the additional 350 calories (in a medium fries)! Instead, order the side salad at a modest 50 calories. There are certainly descent options out there, we just need to be conscious about the choices we make while eating out. And please feel free to shoot me any questions! i am always look for alternatives to normal subway subs and wendy's salads! it can get monotonous! thanks for the suggestions! another option i love is smoothies! but you have to know how to order those...because a lot of them are made with a lot of added sugar! do they have tropical smoothie cafe up there? their food and smoothies are both awesome! there are not enough choices for healthy fast food out there! hopefully more healthy options are added to menus soon! hey check out this article! What a great resource! Thanks for posting ths article!